JS Shaper Awetive - professionally made ​​Joomla template designed for construction sites business subjects from renowned design team JoomShaper, developed under the current version of Joomla 3.2x - 2.5x. Shaper Awetive has a stylish appearance, and has a set of 6 color sets that can be easily customized to your needs in the integrated settings manager. In this assembly template entered set of the best enhancements to visualize laid on the resource content. Template designed based on functional and flexible framework Helix V2, imparting a pattern all the characteristics of almost all modern Internet projects. For more efficient management of content on the site, the assembly was built powerful component K2, managing content. 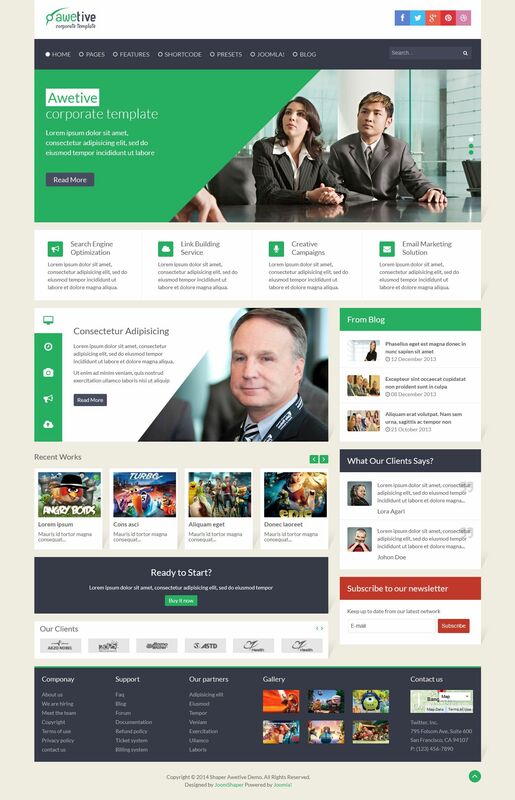 JS Shaper Awetive - this is the best and smart choice to develop a business project or enterprise portal.